The lives of a group of friends living a bohemian lifestyle in New York City while they deal with life, love, drug addiction, and AIDS. For a good stretch of time in Hollywood, it seemed that musicals fell out of favor. The exception to this rule was kids movies and animated films. In the first decade of the 2000's, we saw a resurgence in the genre. "Rent" is part of that resurgence. It is directed by Chris Columbus, who is known for directing "Harry Potter and the Sorcerer's Stone," "Home Alone," and "Mrs. Doubtfire." It is written by Stephen Chbosky and is, of course, based on the stage musical of the same by Jonathan Larson. The cast is mostly comprised of the original actors who performed in the play's initial Broadway run. This includes Anthony Rapp as Mark, Adam Pascal as Roger, Idina Menzel as Maureen, Jesse L. Martin as Tom Collins, Wilson Jermaine Heredia as Angel, and Taye Diggs as Benny. The only two actors who were not in the original Broadway cast are Rosario Dawson as Mimi, and Tracie Thoms, who plays Joanne. The film follows this group of friends who live together in a loft in New York City during Christmastime in 1989-early 1990. Each of them struggles day to day. Some of them are addicted to drugs, others are battling AIDS, and they are always trying to find money to pay their rent without compromising their ideals. 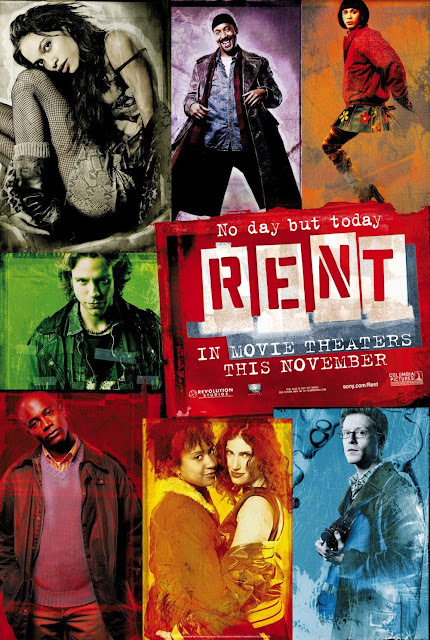 "Rent" is really a slice-of-life film that focuses on the youth counterculture of the late 1980's. It is about a group of idealistic artists who rarely know where their next meal is going to come from. Their biggest worry is selling out and endangering their principles. Oh, and they really, really like to sing a lot. You can tell Jonathan Larson viewed himself in much of the same manner, spending his 20's as a gay artist living in a loft in New York City with many other roommates. This stage musical was very timely as the AIDS epidemic was reaching its peak in the United States around the time of its release. Of course, the film was released over a decade later so it may have lost some of its timely poignancy. It is still about being accepting of different lifestyles, a thing we are still working on as a country overall. As for the movie itself, being a slice-of-life story, it doesn't really have a straightforward narrative. It is more of a collection of happenings and shows the daily lives of this small group of people and tells of the things they experience as part of the bohemian revolution. There isn't really much gained in transferring this material from a stage to film other than gaining access to a larger audience and allowing for more sets, props, and a bigger budget. The acting is good and all of the actors have incredible singing voices. Since they most of the cast are stage performers, it comes with the territory. Being the only film actors, Tracie Thoms and Rosario Dawson still add a lot to this movie and surprisingly have great singing voices as well. Finally, "Rent" is jam-packed with tons of tremendous music. The songs are catchy, and it is almost a guarantee that you'll walk away with many of them stuck in your head. We enjoy most of them, including "Seasons of Love," "One Song Glory," "What Your Own," "No Day But Today," and Lolo's favorite, "La Vie Bohème." We've seen "Rent" dozens of times now and we still really enjoy it each time we watch it. It's a vibrant, passionate musical that everyone should see at least once.